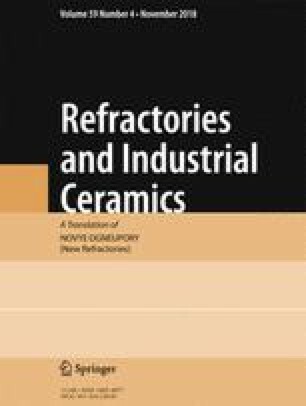 Slag-resistant highly refractory alumina-periclase-carbon ceramic materials are synthesized on the basis of electrocorundum (Kazogneupor), Zinel’bulaksk (Uzbekistan) talc, and enriched graphite concentrate (Uzbekistan). The crystal structure of the material is represented by corundum and spinel. Ceramic specimen refractoriness is above 1800°C, density if 2520 – 2880 kg/m3, water absorption is 6.75 – 11.71%, open porosity is 16 – 29%, and the ultimate strength in compression is 100 – 120 MPa. Translated from Novye Ogneupory, No. 9, pp. 23 – 27, September, 2018.